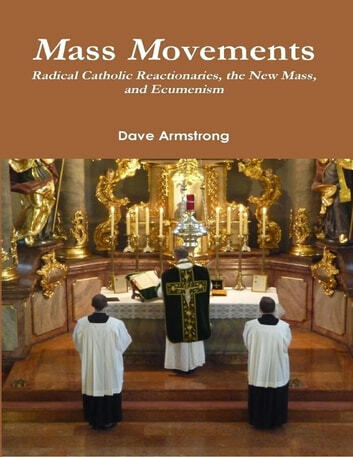 This volume consists of essays on 1) the distinction between the extreme radical Catholic reactionaries and mainstream “traditionalists,” 2) the New (Pauline, Novus Ordo) Mass and its liturgical abuses, and 3) genuine, orthodox (not silly liberal) ecumenism. Radical Catholic reactionaries have been misled by various errors of the nature of what is called "rigorism". This recurring problem throughout Church history is seen in groups such as the Donatists, Montanists, Jansenists, and the Old Catholics who left the Church after Vatican I (1870): an error of thinking and out-of-whack perspective; an inability or unwillingness to think with the Mind of the Church, and a lack of charity. I love traditional Catholic worship, and the Tridentine Latin Mass, and have much affinity with "traditionalists." That’s not what this book critiques. Rather, it criticizes fringe views that seek to “bash” the New Mass as profoundly “inauthentic” and inferior Catholic worship, and to dismiss Vatican II and true ecumenism.